THE highly-touted Amoguis sisters, Lora Micah and Liaa Margarette, of Davao City made waves anew, this time in the just-concluded 82nd Araw ng Dabaw Swimfest at the Fr. Rudy Malasmas, S.J. swimming pool of the Ateneo de Davao University in Matina. Batang Pinoy 2019 Mindanao Leg and Davraa Meet 2019 champion Lora amassed 171 points to rule the girls 13-14 division by collecting five golds (100m freestyle, 100m butterfly, 50m backstroke, 200m freestyle, 100m backstroke), three silvers and one bronze. "My times were actually fine. I'm kind of satisfied," Lora, a student of Abba's Orchard School, said in a Facebook interview with SunStar Davao. 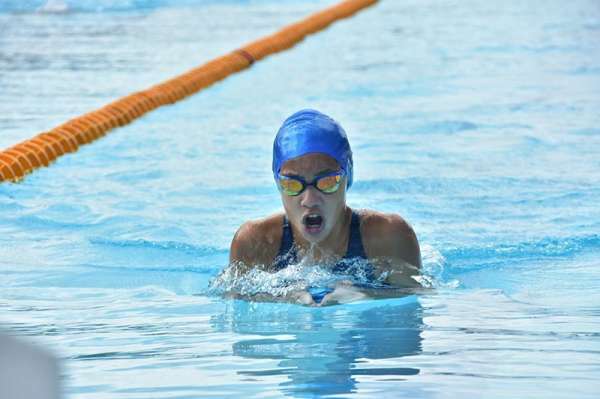 Her younger sister Marga, hailed as most bemedalled Davao City athlete in the Batang Pinoy 2019 Mindanao Leg for sweeping five golds and two silvers in Tagum City, harvested six golds (100m freestyle, 200m freestyle, 50m freestyle, 100m backstroke, 100m butterfly, 200m individual medley), three silvers and two bronzes in the Araw swimfest. Marga, in a separate interview, was contented with her performance. "I beat some of my time. Some I’m really happy with my performance because I’m not a sprinter but managed to get gold and other medals," she said, adding that her Araw stint was far better than her Batang pinoy participation. She, however, admitted she needs to work extra hard in training for her next competition. The Amoguis sisters will next see action in the Philippine National Age-Group Swimming Championships. The other Davao City's most outstanding swimmers were Paulo Miguel Labanon (boys 11-12) of Stella Maris Academy of Davao, Khrystian Tan of Smad (boys 13-14), Erika Lois Suelan of Davao Chong Hua Hi School (girls 15-16), Beatriz Ianne Laolao (girls 17-18), Debi Louise Garcia (girls 19-above) and Kierl Suazo (boys 10-above) of Davao Merchant Marine Academy, Christopher Larioza (boys eight-under). Also topping their respective groups were Jasmien Jyra Cabajar (girls eight-under) of Magugpo Pilot Elementary School, Xyrielle Lixene Chiong (girls nine-10) of Notre Dame Midsayap College, Izyndro Warain (girls 9-10) of Kidapawan City Baptist Heritage, Selwyn Rex Cirunay (boys 15-16) and John Wesley Cuevas (boys 17-18) of the University of Mindanao Tagum. Winners received prizes from the city goverment of Davao through the Sports Development Division of the City Mayor's Office (SDD)-CMO.